When catcher John Slone decided to return to the Cape Cod Baseball League this summer, Harwich manager Steve Englert took up household gymnastics. 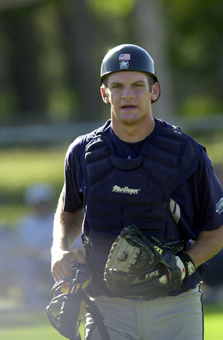 After a college season at Miami University that earned him third team All-America honors, Slone was selected by the Pittsburgh Pirates in the 15th round of the Major League Baseball First-Year Player Draft. With a year of college eligibility remaining, however, this week’s Cape League Player of the Week chose to stay for another year at Miami. Much to the delight of Englert, that also meant another season on The Cape. The possibility of playing on the Cape figured heavily into Slone’s decision to stay in school. It’s clear that Miami loves him back. Slone hit .375 last spring to lead the RedHawks and enjoyed a 26-game hitting streak, fourth longest in Mid-American Conference history, to earn a unanimous first-team All-MAC selection. Three years of success and experience at the collegiate level makes a player like Slone a hot commodity in the Cape League. The Cincinnati, Ohio, native is new to the Harwich organization, but he is a familiar face in the league. Recovering from a finger injury that sidelined him for a portion of his freshman season at Miami, Slone joined the Yarmouth-Dennis Red Sox in the middle of July and started each of the team’s playoff games in 2002. After his sophomore campaign at Miami, Slone played in the New England Collegiate Baseball League last summer, where he hit .321 and stole nine bases. Now Slone is back on the Cape and has taken the league by storm. Last week, he hit .478 in five games, scoring four runs and driving in three. Englert is confident that the junior can. For right now, he’s just happy to be able to have a catcher that can swing the bat in his lineup. Regardless of his success at the plate, it’s his job behind the plate that Slone values the most.